How is it that the air and earth of Vitebsk, my birthplace, and of thousands of years of exile, find themselves mingled in the air and earth of Jerusalem. How could I have thought that not only my hands with their colors would direct me in their work, but that the poor hands of my parents and of others and still others with their mute lips and their closed eyes, who gathered and whispered behind me, would direct me as if they also wished to take part in my life? I feel too, as though the tragic and heroic resistance movements, in the ghettos, and your war here in this country, are blended in my flowers and beasts and my fiery colors. . . . The more our age refuses to see the full face of the universe and restricts itself to the sight of a tiny fraction of its skin, the more anxious I become when I consider the universe in its eternal rhythm, and the more I wish to oppose the general current. Do I speak this because with the advance of life, the outlines surrounding us becomes clearer and the horizon appears in a more tragic glow? I feel as if colors and lines flow like tears from my eyes, though I do not weep. And do not think that I speak like this from weaknesson the contrary, as I advance in years the more certain I am of what I want, and the more certain I am of what I say. I know that the path of our life is eternal and short, and while still in my mother’s womb I learned to travel this path with love rather than with hate. These thoughts occurred to me many years ago when I first stepped on biblical ground preparing to create etchings for the Bible . And they emboldened me to bring my modest gift to the Jewish people which always dreamed of biblical love, of friendship and peace among all peoples; to that people which lived here thousands of years ago, among other semitic peoples. My hope is that I hereby extend my hand to seekers of culture, to poets and to artists among the neighboring peoples. . . . I saw the hills of Sodom and the Negev, out of whose defiles appear the shadows of our prophets in their yellowish garments, the color of dry bread. I heard their ancient words. . . . Have they not truly and justly shown in their words how to behave on this earth and by what ideal to live? 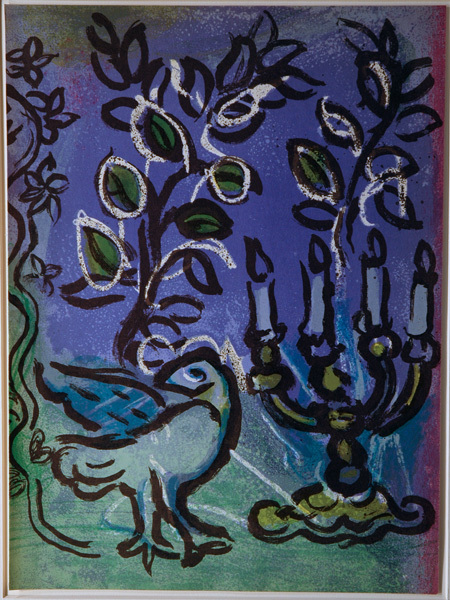 For the 1962 publication of a deluxe book on the making of the Jerusalem Windows, Chagall executed two original lithographs (M. 365 and M. 366) and Charles Sorlier, Chagall's Master Printer at the Mourlot workshop, where Chagall executed all of his lithographs from 1950 until his death, made twelve 20-color stone lithographs after Chagall's final models for the windows under Chagall's supervision. The work was published by Andre Sauret, one of the great European art book publishers of the middle third of the century, and published in an edition of unknown size (although it is hard to find copies now and impossible to find them inexpensively even when they can be found). The image size of the lithographs is 296x215mm; each is prices at $575 and comes matted in an archival 16x20 acid-free museum board mat. The sequence that follows illustrates the windows (which figure the twelve sons of Jacob who became the heads of the Twelve Tribes of Israel) in the order in which Jacob describes his sons in Genesis 49 (see below for full passages): "All these are the twelve tribes of Israel, and this is what their father said to them when he blessed them, blessing each one of them with a suitable blessing" (Gen. 49:28). Reuben. 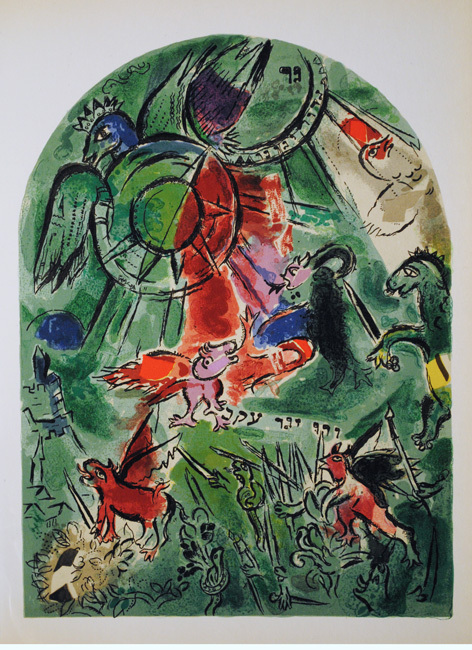 20-color stone lithograph by Charles Sorlier after Chagall's final model for the Jerusalem Windows, 1962. Printed by Mourlot Freres (Paris) and published by Andre Sauret Editeur, Monte Carlo. Edition unknown. Image size: 296x215mm. Price: $575. Simeon. 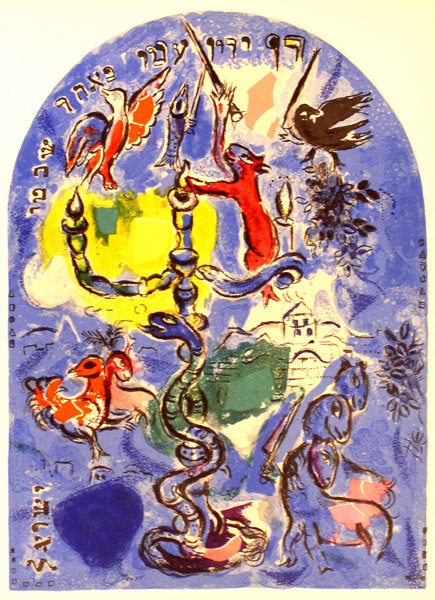 20-color stone lithograph by Charles Sorlier after Chagall's final model for the Jerusalem Windows, 1962. Printed by Mourlot Freres (Paris) and published by Andre Sauret Editeur, Monte Carlo. Edition unknown. Image size: 296x215mm. Price: $575. Levi. 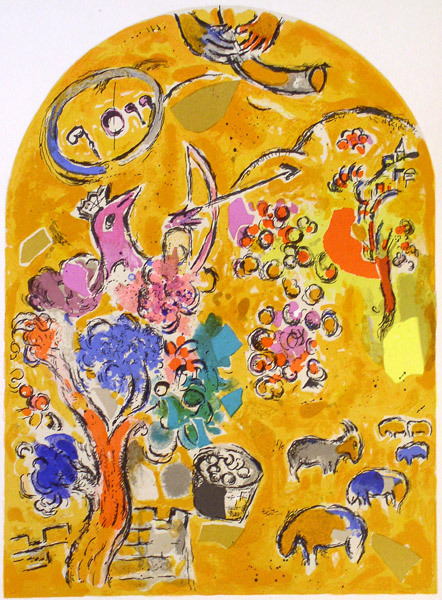 20-color stone lithograph by Charles Sorlier after Chagall's final model for the Jerusalem Windows, 1962. Printed by Mourlot Freres (Paris) and published by Andre Sauret Editeur, Monte Carlo. Edition unknown. Image size: 296x215mm. Price: $575. Judah. 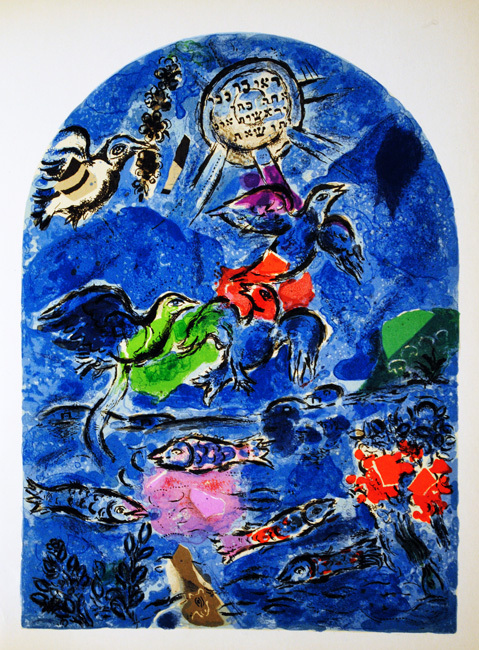 20-color stone lithograph by Charles Sorlier after Chagall's final model for the Jerusalem Windows, 1962. Printed by Mourlot Freres (Paris) and published by Andre Sauret Editeur, Monte Carlo. Edition unknown. Image size: 296x215mm. Price: $575. Zebulun. 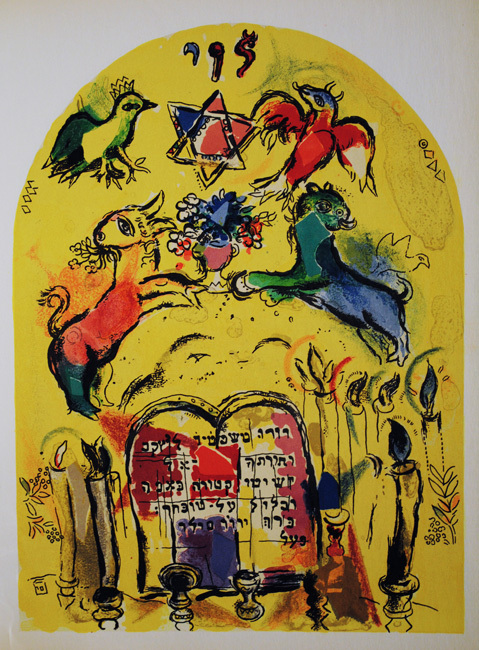 20-color stone lithograph by Charles Sorlier after Chagall's final model for the Jerusalem Windows, 1962. Printed by Mourlot Freres (Paris) and published by Andre Sauret Editeur, Monte Carlo. Edition unknown. Image size: 296x215mm. Price: $575. Issachar. 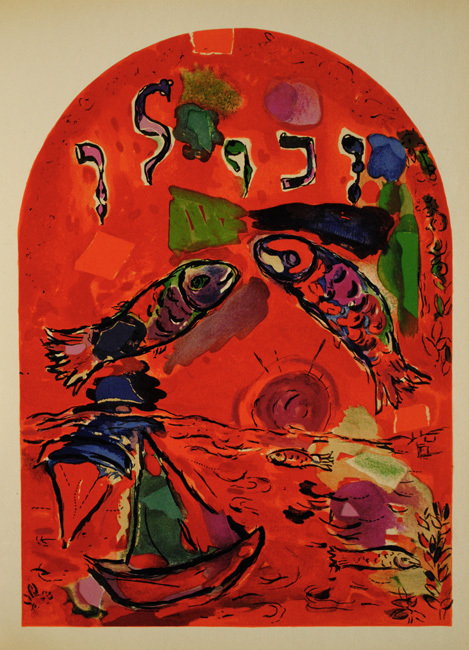 20-color stone lithograph by Charles Sorlier after Chagall's final model for the Jerusalem Windows, 1962. Printed by Mourlot Freres (Paris) and published by Andre Sauret Editeur, Monte Carlo. Edition unknown. Image size: 296x215mm. Price: $575. Dan. 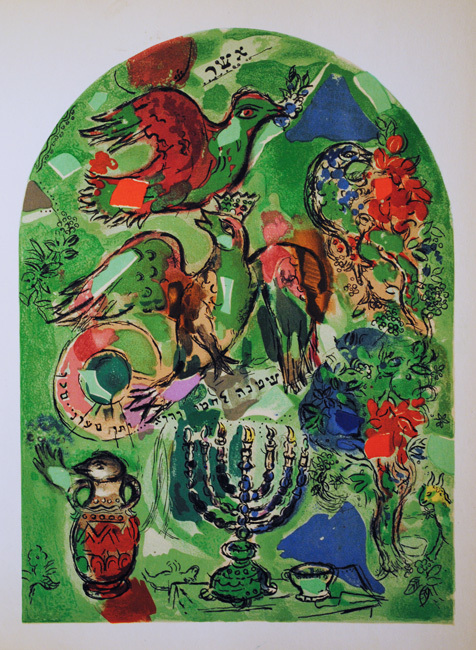 20-color stone lithograph by Charles Sorlier after Chagall's final model for the Jerusalem Windows, 1962. Printed by Mourlot Freres (Paris) and published by Andre Sauret Editeur, Monte Carlo. Edition unknown. Image size: 296x215mm. Price: $575. Gad. 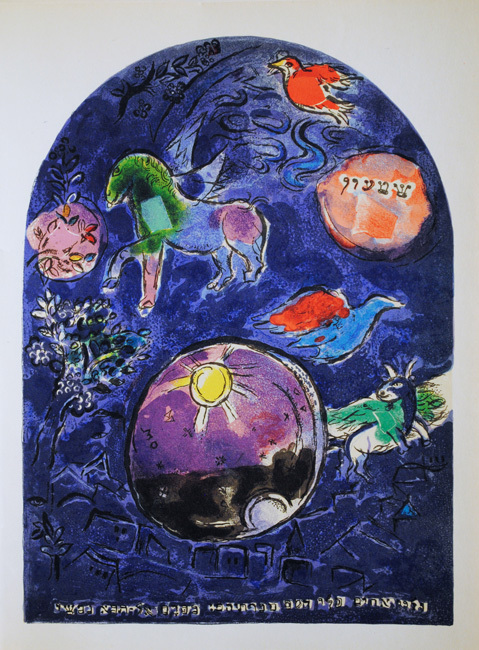 20-color stone lithograph by Charles Sorlier after Chagall's final model for the Jerusalem Windows, 1962. Printed by Mourlot Freres (Paris) and published by Andre Sauret Editeur, Monte Carlo. Edition unknown. Image size: 296x215mm. Price: $575. Ascher. 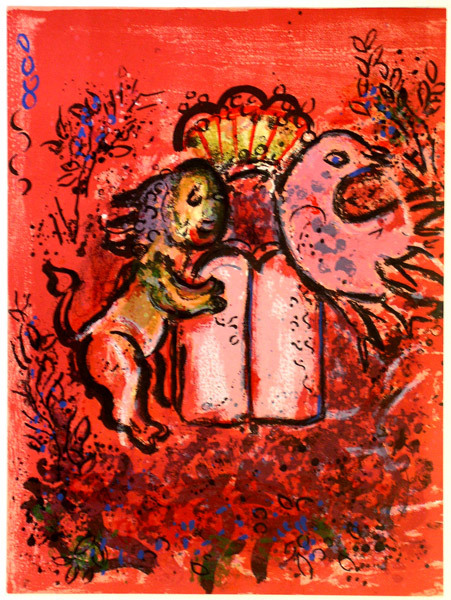 20-color stone lithograph by Charles Sorlier after Chagall's final model for the Jerusalem Windows, 1962. Printed by Mourlot Freres (Paris) and published by Andre Sauret Editeur, Monte Carlo. Edition unknown. Image size: 296x215mm. Price: $575. Naphtali. 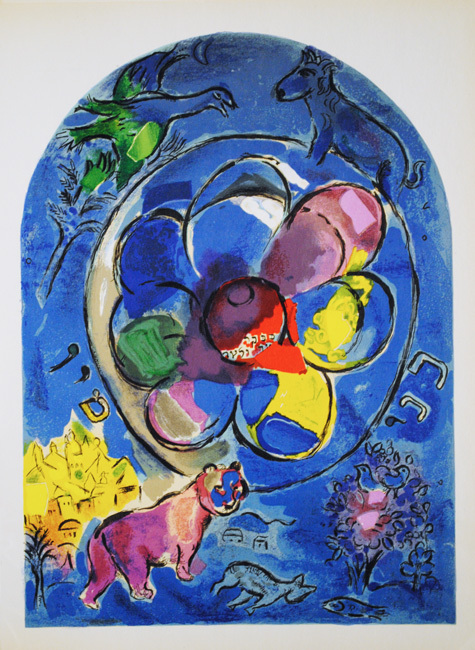 20-color stone lithograph by Charles Sorlier after Chagall's final model for the Jerusalem Windows, 1962. Printed by Mourlot Freres (Paris) and published by Andre Sauret Editeur, Monte Carlo. Edition unknown. Image size: 296x215mm. Price: $575. Joseph. 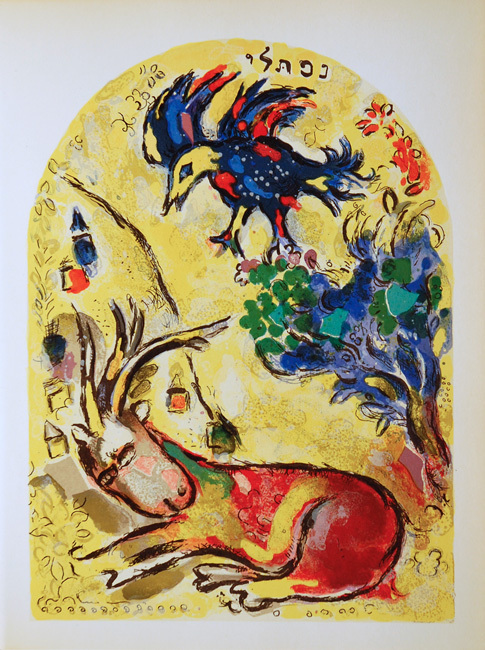 20-color stone lithograph by Charles Sorlier after Chagall's final model for the Jerusalem Windows, 1962. Printed by Mourlot Freres (Paris) and published by Andre Sauret Editeur, Monte Carlo. Edition unknown. Image size: 296x215mm. Price: $575. Benjamin. 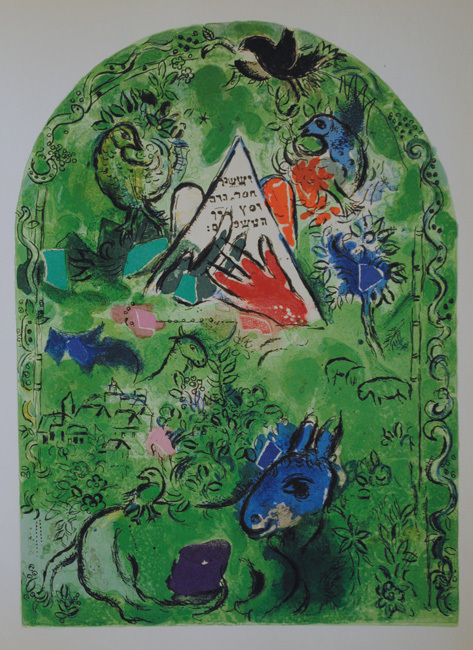 20-color stone lithograph by Charles Sorlier after Chagall's final model for the Jerusalem Windows, 1962. Printed by Mourlot Freres (Paris) and published by Andre Sauret Editeur, Monte Carlo. Edition unknown. Image size: 296x215mm. Price: $575..
Frontispiece, Jerusalem Windows: The Tables of the Law (M. 365). Original color lithograph, 1962. Printed by Mourlot Freres (Paris) and published by Andre Sauret Editeur, Monte Carlo. Edition unknown. Image size: 296x215mm. Price: $1250. The Jerusalem Windows: The Canlestick (M. 366). Original color lithograph, 1962. 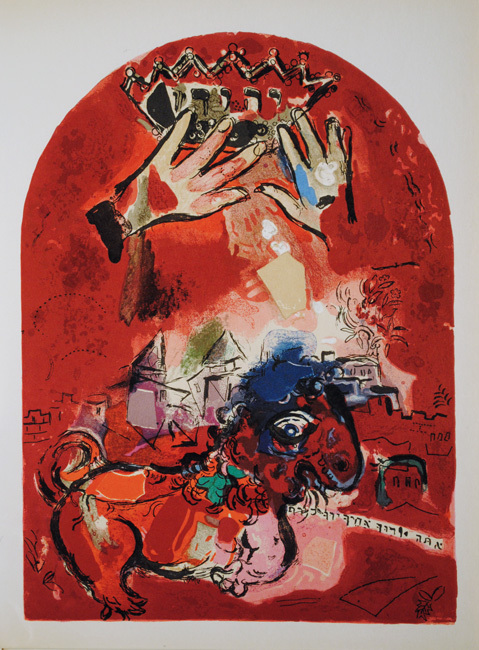 Printed by Mourlot Freres (Paris) and published by Andre Sauret Editeur, Monte Carlo in the deluxe edition of Chagall's Jerusalem Windows. Edition unknown. Image size: 296x215mm. Price: $1250.